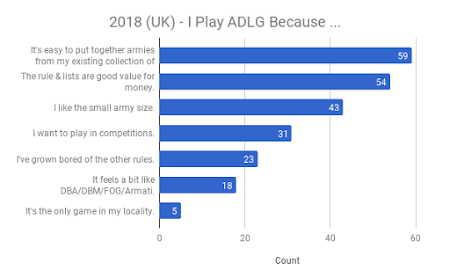 To recap: this survey was run to uncover the reasons behind the current growth in popularity of ADLG in the UK. After one week the survey had gathered 135 responses of which 81 were from the UK. Part 1 looked at the basic information like age, favourite periods, etc and provided some interesting trends. This post will look at players ratings of the game overall, the rule book and the use of the rules in games amongst other things. Respondents rated ADLG very highly indeed (4.3/5.0). On average people gave three reasons for playing ADLG. The top three were all related to financial & practical aspects. Being able to play in competitions came fourth. 57.6% rated ADLG as of average complexity/simplicity. The rule book is easy to read but more difficult to refer to during a game. The Lists, Set up, & Movement sections were the easiest to use. The Index, Melee & Shooting sections were rated the hardest to use. On average people used three sources to get help with ADLG. The official FAQ was the most used source of help. This was done by asking about respondents' experience with ADLG so far on a five point scale from disappointing to excellent. A score of 3 is midway between the extremes and taken as average. Straight away you can see that players have rated ADLG very highly indeed with just over half rating it excellent and an average rating of 4.36. This strong positive rating may help explain why the UK competition scene is growing so strongly. The pattern for the international responses is similar with a slightly lower average rating of 4.27. A list of seven reasons was offered. Any number could be chosen with an option to add others not covered by the first seven. There are two ways to look at this data: how often a reason was cited and how many respondents cited a reason: they tell a similar story but the numbers are different. The former is much easier to illustrate and I'll start with that before moving onto the latter. The top three reasons accounted for 67.0% of the 233 reasons given and I think these reflect financial and related practical concerns. The next three reasons account for only 30.9%. Clearly they have far less influence than the top three. If you already own armies all you need to play ADLG is a rule book which is good value for money. You don't need anything else and you don't have to rebase your collection. If you're starting from scratch the value for money rule book and the small army size make it relatively quick to build an army without a great investment in either time or money. 96.3% of UK respondents were over 35 years old and 44.4% were over 55. On average, they had used, or were using, 2.91 other rules. 66.7% have played (or still play) DBM and 48.1% FOG AM v1. This group of older, more experienced players is far more likely to have existing collections and rate the ability to use them highly. The importance of value for money cannot be overstated. 66.7% of UK respondents thought ADLG represented good value for money. I assume this is compared to the current fashion of rule books costing £25-50, and the need for multiple army lists books costing similar amounts. 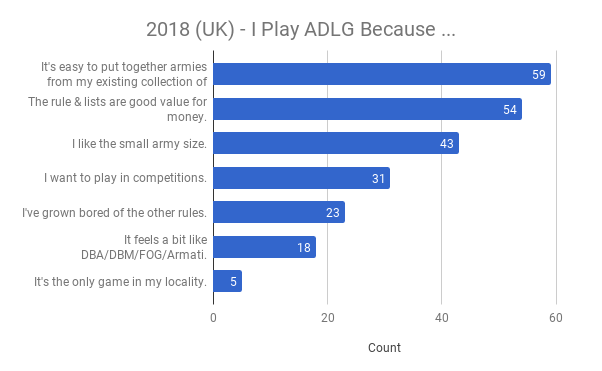 ADLG looks to have hit a financial "sweet spot" with a low "financial barrier to entry" especially for experienced wargamers and this is clearly a major part of why it has proved so popular in the UK. Finally in this section, the ability to play in competitions ranked just outside the top three. It was mentioned by 38.3% of UK respondents. This is lower than I had expected and suggests that the UK respondents are a roughly even mixture of competition and casual players. 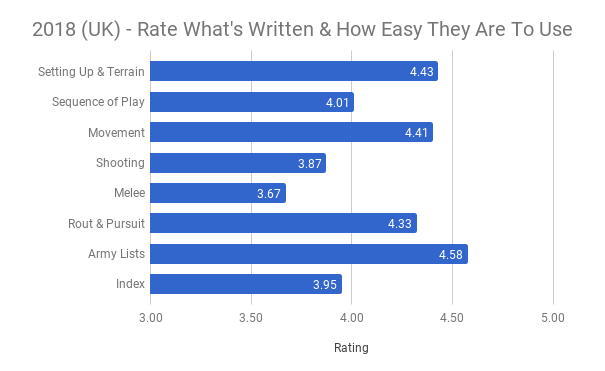 If respondents owned a rule book they were asked seven questions designed to rate the rules, the contents of the book and its ease of use during a game. All ratings were on a five point scale with 3 being average and 5 (usually) being strongly agree. Looking at this in more detail: 57.6% rated it as average while no one rated it as very complex and only 2.5% rated it as very simple. The book content ratings are all higher than those from its use during the game. Clearly the number of diagrams is seen as a big positive for ADLG. The contrast, although not massive, highlights the difference between reading a rule book and using one during a game. I'm tempted to suggest the book reads well as a book but does not function as well when used as reference during a game. The sections of ADLG were rated in terms of what's written and how easy they are to use using a five point scale from difficult (1) to easy (5) to understand. This was designed to probe the specific processes within the rules (move, shooting etc) and compliment the general ratings in the previous section. The first thing to note is the generally high ratings across the board. All parts are clustered either side of relatively easy to understand (a score of 4). The individual ratings are almost all higher than those in section 2.3 especially the overall complexity rating of 3.20 +/- 0.76. In the above a score of more than 1, or less than -1, has a 65% probability of not occurring by chance. Scores above 2, or below -2, have a 95% probability of not occurring by chance. The major positive differences are restricted to certain parts of the rules: set up, movement and the lists. In my experience these are the simplest sections and only movement is used repeatedly during a game. The frequently used and vital "meat" of the rules, shooting & melee, are rated considerably lower and are much closer to the "in play" ratings of section 2.3. The relatively low rating of the index is consistent with the rating shown in section 2.3 for the ease of finding things in the rules during a game. It is likely that the low rating of the frequently used combat sections had a strong influence on the lower overall ratings in section 2.3. I have some evidence to support this but I will delay dealing with until Part 3. 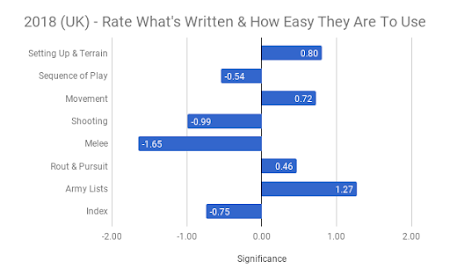 Overall these ratings show that the melee & shooting processes are the least straightforward parts of the rules and the suggest the rules & processes could benefit from some careful editing in any new version or support documentation. The pattern for all respondents (UK & international) was similar. Learning new rules, improving your standard of play or just relying less on the rule book requires help. So where did respondents get their help from? As before there are two ways to look at this data: how often the source was mentioned and how many respondents mentioned a source: they tell a similar story but the numbers are different. The former is much easier to tabulate and I'll start with that before moving onto the latter. Once again people mentioned an average of three sources of help (or 3.20 to be exact) and these accounted for 66.4% of all mentions and the top four for 80.4%. The pattern for international respondents was similar with the same top four sources accounting for 84.7% of all mentions. The exact order differed slightly but the top two were the same. The importance of the official FAQ is underlined by using the second way of looking at the data. The official FAQ was mentioned by 86.4% of UK respondents. This was followed by the ADLG forum (65.4%) and people's opponents (60.5%). As an aside I was surprised that in this modern age that Facebook didn't crop up more often. Perhaps this is related to the age distribution? Congratulations on making it this far! I hope you've found it interesting? Let me know in the comments. 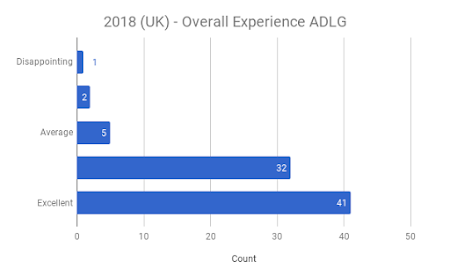 There's not much more to add as I've now covered all the basic results from the 2018 ADLG survey. In a final post about the survey (Part 3) I will look at a couple of interesting correlations between pairs of ratings. It will be a shorter post I promise. Meanwhile if you have any questions ask away. Likewise if you'd like me to look at the data in certain way add a comment I'll see what I can do. I don't play ADLG, but having read these 2 posts on the survey (well, skimmed tbh! ), I'm seriously considering getting it. Glad the survey was of use. There is a lot to read at once isn't there? Thank you Martin, this has clearly been a significant amount of work on your part and the results are very interesting. Thanks Kevin. It's nice to know it's of interest to others. Crunching the numbers wasn't too bad and I enjoyed working out the best way to illustrate the points. However I wouldn't want to do this every week. Part 3 is written and will be published on Friday. Part 4 (ADLG v DBMM surveys) is also written and just needs one last bout of proof reading.